This article is about a non-fictional entity (NFE). The State Research Center for Applied Microbiology and Biotechnology (SRCAMB) is a research organization with a history deeply intertwined with the Soviet biological weapons program managed by Biopreparat. The QR code found on page 20 of Rhea's Confession links to a page that does not exist at SRCAMB's website, http://www.obolensk.org. In the early 1970's, a researcher and advisor convinced Soviet leader Leonid Brezhnev that the USSR needed to develop a biological weapons program. This program was a blatant violation of the 1972 international Biological Weapons Convention, so the program necessitated extraordinary security and secrecy. 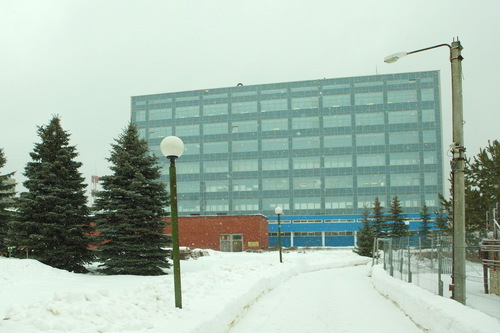 SRCAMB was founded in the mid-1970's to assist in applied microbiological research at Obolensk, near Moscow. Although the Obolensk complex had been operational since SRCAMB's founding, construction on its enormous primary structure, Building N1, was only started in 1980 and completed in 1986. This building's laboratories became operational in 1988. It's primary facilities were designed look like a sanatorium in order fool Western intelligence services. At its peak in 1990, this facility employed at least 2,900 people. The N1 Building is likely to be the 'Corpus 1' spoken of by The Junsui. Building N1 had 9 stories and occupied an area of about 37,000 m2. Floors 1 and 2 housed administration, refrigeration, heating, and storage facilities. Floors 3-8 contained laboratories, each floor generally being dedicated to research on a particular genus of bacteria (one of Bacillus, Brucella, Burkholderia, Legionella, Francisella, and Yersinia). Each floor had its own aerosol testing equipment and vivariums. The more than 200 laboratory rooms were supplied with filtered air and had negative air pressure. Floors 3 and 4 contained high-security Bio-Safety Level 3 (BSL-3) and BSL-4 laboratories where work was done on the most dangerous pathogens. Floor 4 additionally contained a unique device, the "Static Climactic, Horizontal Dynamic Device SC-10-HDD-600", which was used to study the effects of aerosolized bacterial pathogens on animal test subjects within a special chamber. This device was extremely important to the Soviet bio-weapons program because it allowed for "safe" testing of aerosolized pathogens developed at SRCAMB. Floor 9 contained a small-scale production facility with fermenters of capacities up to 100 liters. Following the dissolution of the USSR in 1991, funding to SRCAMB ceased. Microbiological research continued at the facility, funded by credit secured by directors, but the research focus had changed ostensibly to non-military projects. The increased transparency of the new Russian Federation meant that foreign inspectors would be visiting the Obolensk facility, and steps were taken to hide or dispose of evidence of its past as a biological weapons research facility. In 1992, the International Science and Technology Center was created as part of an international agreement. One of the ISTC's stated goals was to prevent proliferation of weapons of mass destruction by employing ex-Soviet scientists and redirecting their research efforts toward peaceful endeavors. SRCAMB has been funded by the ISTC since 1995, and its activities appear to have shifted toward prophylaxis and epidemiology. In 2003, Vladimir Volkov (whose name appears on the whois information for obolensk.org) took over scientific responsibilities amid financial problems and a bankruptcy filing the previous year. In April 2004, Galina Boldyreva, a researcher who worked on the third floor of the N1 building as part of the Department of Highly Virulent Infections, became infected by a strain of B. mallei (glanders). How she became infected has not been established, but this appears to be an isolated incident. She died of her infection two weeks later. SRCAMB continues to operate to this day. Despite its allegedly civilian research projects, it still routinely researches highly infectious and dangerous pathogens, and many details of its past as a biological weapons research facility are still murky or unknown. Bonfire conducted research into the cultivation and bioengineering of new bacterial pathogens with enhanced virulence, immunosuppressive characteristics, and antibiotic/vaccine resistances. Pathogens researched included anthrax (B. anthraxis), plague (Y. pestis). This program's primary goal was to increase virulence of known pathogens and to convert opportunistic pathogens and non-pathogens into pathogens. It's research centered on "bioregulator peptides", including "neuroregulators" and "immunoregulators", in order to produce a range of effects on a host, including psychological/neurological effects and immunosuppression. Factor included research into Venezuelan equine encephalitis virus being combine with Y. pestis (plague) in order two create a 'double pathogen'. The Y. pestis pathogen would be the primary mode of transmission, and inevitably treatment with tetracycline would cause activation of the VEEV virus and encephalopathy. It is not known whether this 'double pathogen' was ever successfully created. Metol was a research program that studied potential applications of bacterial pathogens generated by another subprogram, Bonfire. It sought to characterize new pathogens in terms of their behavior when aerosolized, environmental resilience, and growth characteristics. This program was conducted primarily at SRCAMB and Omutninsk. This URL would appear to point to a login page, but unfortunately, neither URL is active (404). This discovery did, however, link SRCAMB to this investigation and prompt the above research. As of 7 September 2013, no further connections between Rhea Numitorova, Rhea's Confession, or The Junsui have been established.